Your move is important to us, we have a moving solution that suit your needs. Moving to or from Worcestershire & Herefordshire? 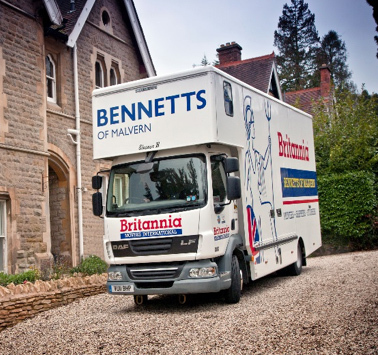 Relocating nationally or internationally, Britannia Bennetts can offer you the professional, quality, personal service you and your family need. We understand that you have choices to make when it comes to your removal and we will take the time to discuss and plan your move with you, taking into account your time-scales, ensuring that our removal crew are fully briefed about your packing and moving requirements so that your belongings are moved efficiently to your new home. If you are unable to move directly to your new home we have hold-over and storage options to offer you. 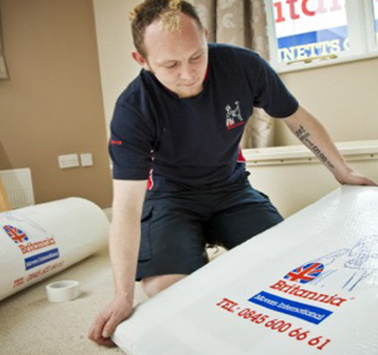 We will go the extra mile to ensure that you are confident to make Britannia Bennetts the right choice for your move. Once you contact us, either by telephone, e-mail or calling into our office, we will arrange for an experienced surveyor to visit your property for a free, no obligation quote. They will be able to put your mind at rest if you have a piece of furniture that you feel may be difficult to get out of your existing home or, into your new home. We know all the local neighbourhoods and streets, and many of the houses’ unusual quirks so if anyone can manoeuvre your furniture in safely we can! We can advise on parking issues, making sure that things go smoothly on removal day. Sometimes packing can seem an endless task, if you have a busy life it can be a struggle to start packing early enough before moving day arrives, sometimes health problems mean it is an impossible task, and sometimes, you might just want to know that someone else is taking care of this so you don’t need to worry. 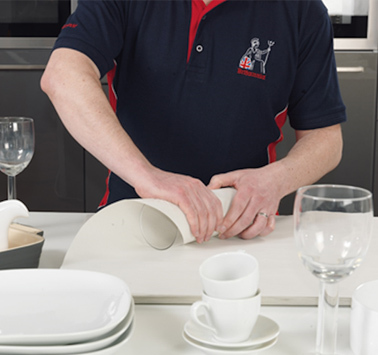 Our specially trained staff can pack your whole home carefully and quickly, using sturdy boxes, clean paper and padded covers to protect your household contents. 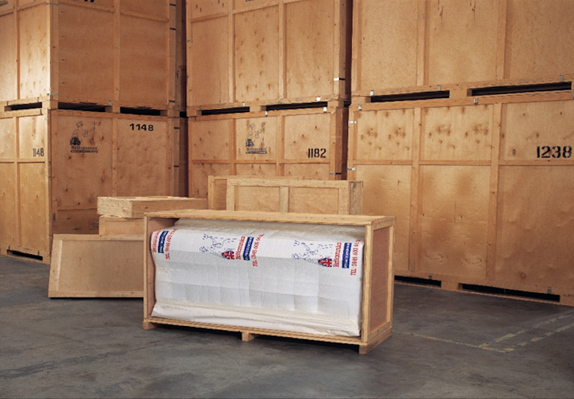 We understand that some items are very precious and often sentimental so we will protect these items by packing them to export standard, ensuring that everything arrives at your new home safely. If you decide that you prefer to undertake the packing of your effects we can supply you with boxes, tape, paper, linen bags and numerous other materials – the choice is yours and even if you are just sorting out your loft, you can buy materials from our stock at our warehouse. Find out about our packing options. We understand that during your removal you may need short or longer-term storage, whether this is a planned part of your moving process or, a sudden requirement if things don’t quite go as planned. 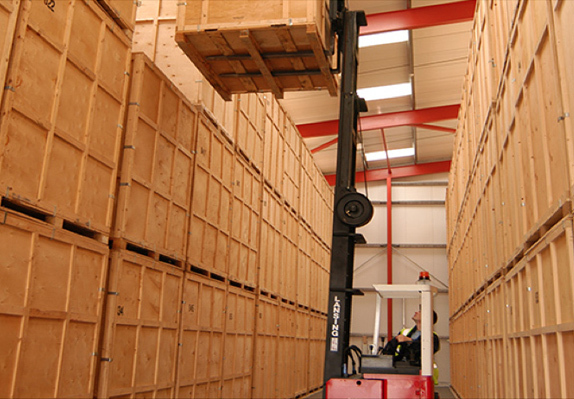 Our modern, internal, containerised storage facility is able to meet your needs re security, cleanliness and safety and you can see exactly where your effects are stored. We also offer the latest DIY storage option – self-storage – our individual lockable rooms are easy to access, flexible to meet your needs and a highly cost-effective method of storing furniture and effects, come and see for yourself. If your direct move has a last-minute delay and you have an unplanned need for storage of just a few days in between moves, we can offer you a hold-over facility, reducing your handling and moving costs substantially. Once you find your dream home, we can arrange speedy delivery of your stored belongings. We have tried to think of every way we can minimise your stress during the moving process as we have been moving customers for over 30 years. We think you will like our range of options, when it comes to moving house we are happy to answer to all of your questions. There are lots of things that you can do in the months, weeks and days leading up to your move to prepare for the big day. We hope that you will find our advice moving guide full of useful practical tips to help you make moving day a smooth, well-planned process. If you need to move just a couple of items, locally or nationally, we can help. No job is too small as we have a wide range of van sizes, all bespoke for moving furniture and effects. We can help with internal moving from room to room, particularly when you need to move a heavier item upstairs. We also offer a ‘part-load’ service where you may have one or more boxes or items of furniture that you need to transport to London or the South East, North into Scotland or even internationally – we travel to London fortnightly and client moves take us all around the UK so transporting a small quantity of effects may be a lot more reasonable than you might have first thought! Talk to our knowledgeable office staff and they will be able to advise you or, a surveyor will contact you to get the information we need to advise you on the cost and how we might be able to help. or call into our office and find out how we can help you take the next step towards a stress-free moving experience.